Farrell Brothers Inc. has been the Capital District Region's heating, plumbing and air conditioning specialists for nearly 90 years in upstate New York and knows its towns, cities and villages; its people and their homes like family. Our satisfaction comes from our commitment to making a better ~ healthier ~ safer lifestyle for each and every one of our customers. What happens when you set your home thermostat too high? Your furnace wastes money. 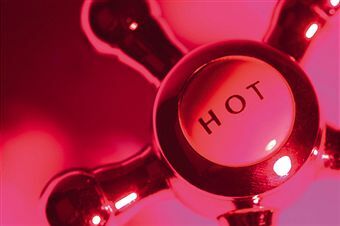 And, if you set your water heater thermostat too high, what happens? Your washing machine, dishwasher and every faucet in the house wastes energy. But more seriously, you or your family could suffer serious burns. There are nearly 3,800 injuries and 34 deaths reported every year because someone is scalded in their home from excessively hot tap water, according to the Consumer Product Safety Commission (CPSC). Here are some tips for being smarter and safer with hot water. Most water heater thermostats lack a dial that indicates precise temperatures, so it's tempting to just pick a random setting. But some heaters can deliver 160-degree water—10 degrees hotter than what causes third-degree burns on adults in only 2 seconds. Instead of guessing, set the dial at the halfway mark and allow water to reach its standby temperature (after the burner goes off). Then run only hot water for one minute at the faucet nearest the water heater and test the temperature using a meat or candy thermometer. Retest and adjust the dial until water reaches about 120 degrees, which is a temperature suggested by the CPSC. That 120-degree setting handles most household needs, such as bathing and laundry. (Few fabrics today require washing at the "hot" setting.) Dishwashers, however, require 140-degree water to effectively dissolve the detergent and clean dishes. When replacing your dishwasher, consider one with a booster heater that raises the tap water temperature. This feature pays for itself within a year if you lower your water heater setting, according to the U.S. Department of Energy, which offers these tips on reducing hot water use. We hope you find our articles informative and appreciate your visit and taking the time to share your comments with us. It is our hope you will come back time and again. Should You Replace A Working A/C System?